An outdoor patio makes a great addition to any yard. With less upkeep and maintenance than a wooden deck, patios made from concrete pavers are versatile, durable, and more environmentally friendly than wood decks. With the right preparation and patience, you can learn how to install concrete pavers. When considering the installation of an outdoor patio, there are several considerations to make and materials to gather before you begin. Planning the area to be paved should always be your first step. You will first need to decide where your pavers are to go and whether there will be enough space for the project you have in mind. Before going outside and starting the excavation process, it’s a good idea to draw out and measure what you envision on a piece of graph paper. 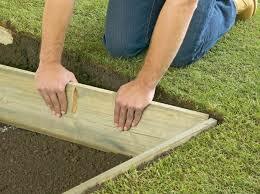 Next, lay out your planned area using a string line and stakes. After you have finished, go back and, using a can of spray paint, draw a line eight inches outside of the previously marked area. Lastly, don’t forget to pitch your patio away from your building. This is one of the most common mistakes made by DIY installers. This will help to prevent water from pooling or ponding in the living area. 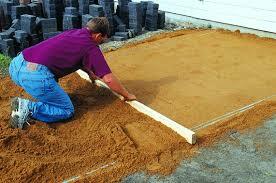 Begin by measuring the width and length of the area to be paved. Multiply these two numbers together to determine the square footage area to be paved. 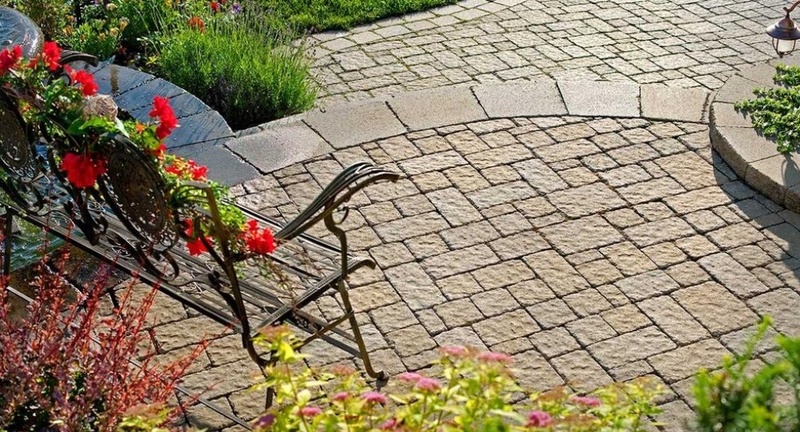 If there are curves or cut-outs, it is recommended that you add 10% to your square footage to account for the quantity of pavers that may need to be cut. The square footage of the area to be paved should then be multiplied by the paver coverage rate, which can be obtained by your supplier. Example: 100sf x 4.5 pieces per square foot = 450 brick needed plus 10% = 495 brick total. The first step in the excavation process is to determine what height the finished product is to be and not exceed. Remember, the slab should slope downwards away from the house or structure, to allow for water drainage. For every 4 feet of flat area, you should slope 1”. It’s a good idea when laying out your outdoor area to plan for this and set your exterior stakes with this in mind. Next, you will need to calculate the total depth of excavation needed. 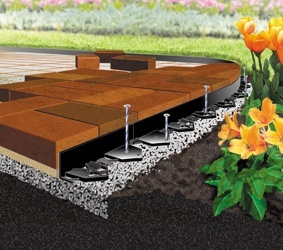 Do this by adding the total depth of the base, which is usually 8” to 9” of gravel, the depth of the bedding sand 1”, and lastly the thickness of the paver to be installed. This will give you the total depth needed for excavation. Remove all material down to the indicated depth, then level and compact the area with a plate compactor or similar machinery. Once the excavation is complete, it is recommended that a temporary border be established for rectangular areas, using 2 x 4’s set at the correct heights and slope. Once the excavation is complete, the next step is laying the base material. The base usually consists of crushed rock such as ¾ minus gravel. 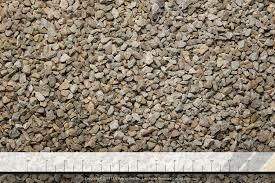 The crushed rock has varying sized stones with sharp edges and size variance, which makes for easy compaction. Using crushed gravel that has little moisture in it makes compacting much easier. The base material should be laid to a thickness suitable for the planned use, which depends on the sub-base material and the weight to be placed upon the paved area. If your sub-base is soft clay, then a thicker layer will be required. If the pavers are to be driven on, a thicker layer will be needed than that for a patio. Check with your supplier for recommendations. Edge restraints are essential to the maintenance of your paved area. If edge restraints are not installed, your pavers will move and separate. Harsh weather and high traffic, along with no edge restraints, will ruin your paved surface. Edge restraints can be made of plastic, pre-cast concrete, metal or wood. Before laying the concrete pavers, a layer of bedding “concrete” sand is placed over the compacted base material. This layer provides a bed into which the pavers are set. 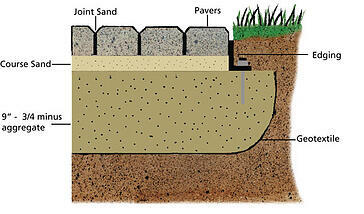 The sand bedding also helps to protect the sand joints from being eroded away. Lay down an inch diameter galvanized or PVC pipe parallel to one of the outside edges of your patio form, and several feet away from the edge. It’s best to use an eight- or ten-foot long piece of pipe as a screed line. Next, fill the area between the pipe and outside edge with the concrete sand material. Then use a straight two-by-four as a screed tool. Place the two-by-four perpendicular to the screed pipe, pulling it from the top to the end of the pipe, raking the sand either towards or away from the two-by-four board as needed. Carefully slide the pipe to the next section or remove it if finished. This process will ensure that a uniform, one-inch thick layer of sand has been laid. 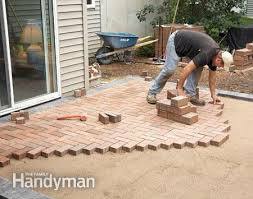 Lay the concrete pavers in the pattern and design of that you have planned. Lay them close together—some pavers have space bumps incorporated into the paver design. If pavers need to be cut to size, use a diamond saw, masonry chisel, or mechanical splitter and safety glasses. After all the pavers are laid, use a mechanical plate compactor with a rubber pad on the bottom to help set the pavers into the sand bedding. This step involves sweeping sand over the surface which fills up the joints and locks the pavers into place. It’s important to use fine-grained sand, rather than a coarse one. Sifted and bagged play sand works well, as does anything labeled as “paver sand.” Today, polymeric sand is used in place of the previously mentioned types of sand. The reason for this is that polymeric sand will harden, which keeps anthills away and keeps grass from growing between the pavers. The sand and paver area must be dry to complete this step. First, clean and sweep the newly paved area in order to remove all materials and debris. Seal the area with a sand binding sealant. This will ensure that the joint sand will not disappear. This will also prevent the growth of vegetation between the joints. Sealing your pavers helps prevent stains from oil, grease, grime, rust, moss, algae, tire markings, and day- to-day spills. The sealant allows you to clean off such stains with greater ease. Maintenance is usually not an issue when it comes to concrete pavers, if they have been laid properly. The overall function and use of your paved surfaces should be stable. Re-sealing your pavers may be necessary on a regular basis to maintain color and appearance. It also helps protect the pavers against stains, algae and loss of joint sand. Regular cleaning and sweeping of the pavers is recommended. This is particularly necessary if your pavers are in shaded or damp areas, when they are prone to efflorescence “chalky salt deposits” and moss build-up. If polymeric sand is not used, power washing usually isn’t recommended because it will dislodge the joint sand.